The Aiton Barn, a 36’ x 48’ Modular Barn with one 10’ x 48’ Open style Lean-to, and one enclosed Lean-to. The frame is solid oak wood, with 4”x4” and 4”x6” weight bearing post, and 2”x4” framing for siding support. Barn is covered with 1”x10” white pine siding and battens. This barn includes five 12’x12’ Horse Stalls with a 36” partition grill and black powder coated chew guard for protection. One 12’x12’ wash stall with pressure treated 2”x8” Yellow pine, opened to the center aisle. Each horse stall includes one 4’x7’ Dutch Door with a window and one 4’x7’ sliding door with grill and 2’x8’ T&G yellow pine planks. 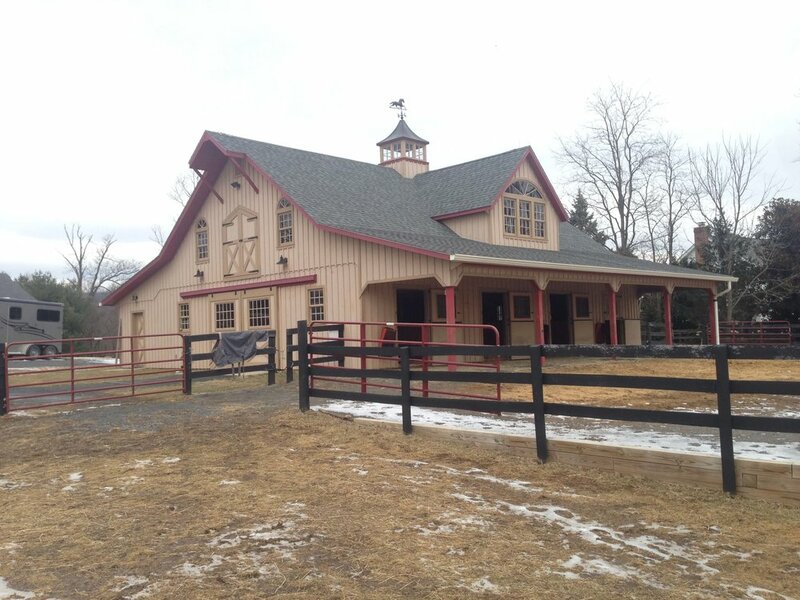 This barn also features a large tack room that is extended out to the enclosed lean-to. Finishing up the barn with a full loft are two large dormers with three double hung windows and a half moon window at the top. To top it all off, this beautiful modular barn features a large built in Cupola with a total of eight 4 lite windows with a copper top and horse weathervane. This barn will leave you wanting a replica!